Many of us in the field of GIS believe that the geographic way of viewing the world and geospatial tools are too valuable and useful to be confined to one discipline. Rather, GIS needs to be embedded into business, planning, environmental science, mathematics, engineering, history, language arts, biology, chemistry, archaeology, and others. We also believe that GIS needs to be included in every person’s formal education from primary to university level and offered in informal settings such as libraries, museums, and in after-school programs. Who will undertake the task of making all of this happen? Educators committed to the value of GIS, who understand its capabilities, and are equipped to train and present the GIS method and framework to a wide variety of audiences and settings, that’s who. Empowering educators to spread GIS throughout education has been the focus of the Teachers Teaching Teachers GIS (T3G) institutes at Esri headquarters in Redlands, California. Three institutes, co-sponsored each June by Esri and GeoTechCenter, have enabled participants to promote and support GIS in other departments, other educational institutions, in their local community, and in their professional networks. Unlike events that focus on “learning how to do more with GIS,” the T3G institutes focus on “helping other educators use GIS effectively.” Participants work through a series of hands-on activities to improve their technical skills in online and desktop ArcGIS tools. This includes work with geoprocessing, spatial statistics, Landsat imagery, 2D and 3D tools, and ArcGIS Online maps and presentations. Yet the institutes go beyond the improvement of GIS skills to how best to teach with GIS in different educational settings, from online courses to semester-long face-to-face courses to short workshops. Participants create a project where they spatially analyze data they collect at the Gilman Historical Ranch, including elevation, weather, invasive species, bird nests, wildfires, tree health, and more, and presented the results using ArcGIS Explorer, ArcGIS Online, and ArcGIS desktop. The 30 attendees each year range from 4-H coordinators to university professors and librarians to secondary school instructors. The institute teaching team includes educational consultants Kathryn Keranen and Lyn Malone, Amy Work from the Institute for the Application of Geospatial Technology, Anita Palmer and Roger Palmer from GIS ETC, and Esri education staff Charlie Fitzpatrick, Laura Bowden, and Joseph Kerski. The teaching team models different instructional activities, including gallery walks, instructor-led training, independent investigations, group projects, a “geo-news” broadcast, a game show “Deal With It” competition, and other methods. Applicants interested in applying for the 2012 T3G institute should have a strong interest in training other educators in the use of GIS in instruction, developing curricular materials that help educators and students use GIS, and promoting GIS to educational administrators and policymakers. 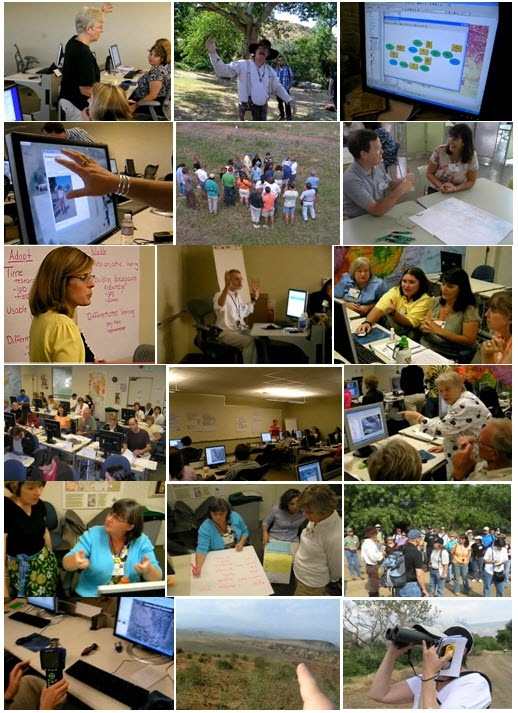 Preference will be given to educators from various settings who have demonstrated experience in three areas: Using GIS, teaching with computers, and providing professional development for educators. Watch http://edcommunity.esri.com/t3g for announcements, and please consider applying to the 2012 T3G institute or telling your colleagues about it.